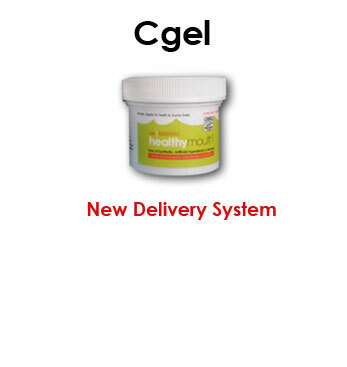 Patented healthymouthTM, anti-plaque topical gel for dogs and anti-plaque topical gel for cats are clinically proven and BOTH recipients of the VOHC (r) Seal of Acceptance, awarded April 2011. 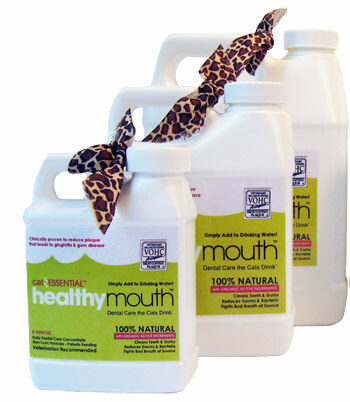 Free of all artificial synthetic ingredients or alcohol, the gels provide a dental health care agent to prevent, improve and maintain the dental health of your dog and cat as the home care portion of an overall dental care program that starts with examination and professional dental cleaning with dental x-rays. Double the amount of product for the same price! Less Packaging. More Product. More Environmental. 100% Free of Artificial or Synthetic Ingredients. Very high rate of acceptability backed by 100% refund policy. 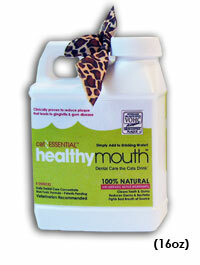 Natural fish flavoring cats love! Add to your cat's drinking water each time bowl is refilled. Turns water a pleasant apple green. May need to be integrated slowly over 2 week period, as you would when introducing any new product into your pet's diet by adding extra water. This is perfectly normal as many pets do not like change...much like children! Unopened and opened jugs good for 24 months. Designed to replace all regular water consumption. 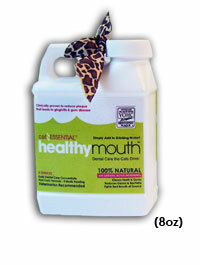 Replace healthymouthTM water as you would regular water. Does NOT lose efficacy if in bowl for more than 1 day. Benefits achieved by the continual, daily consumption - we understand that cats all drink different amounts. Advised method of use is to mix formula with one gallon of water in sealed container and simply fill and refill bowl from larger container. 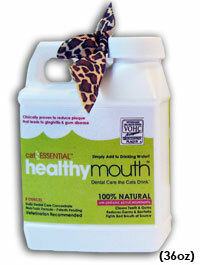 Formula mixed with water in SEALED container is good for up to 2 weeks. With or without refrigeration. PLEASE NOTE: If you use a water fountain, filter must be removed or it will filter out the actives. Healthymouth LLC will unconditionally refund your payment if your cat will not consume.